When America entered the Great War in April 1917, it had a small constabulary Army with no experience in industrial age warfare. It was spread from the east coast across the nation and the Pacific to the Philippines. Nineteen months later the United States had a 2 million man force concentrated in France. Flanders and Italy. 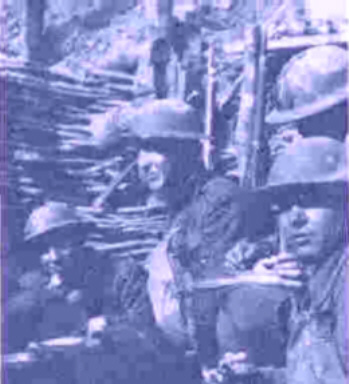 Towards the war's end the American Expeditionary Force or AEF, as it came to be known, was occupying more of the Western Front than Britain and all her Commonwealth Nations combined, lending combat divisions to all the allies and leading offensive operations against the best defended sector still occupied by the Germans. 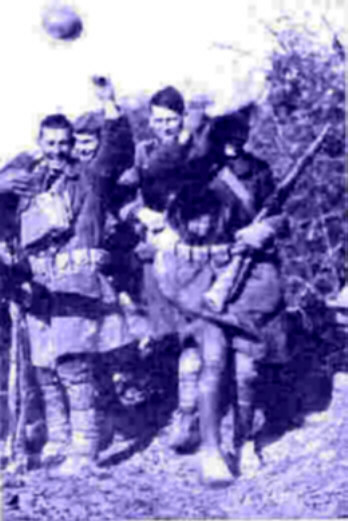 The AEF could claim when the Armistice came to have never failed on the defensive to turn back the enemy nor failed on the attack to achieve its aims. Much has been made in the last 80 years by former allies, academic historians and documentary film makers of the rough fits and starts and frequent gross inefficiencies of the American troops and their commanders during the First World War. Claims have been made on television recently that the United States made minimal military contribution to the war's conclusion and [grossly inaccurately] that the US only fought in one battle. The intriguing new work by Niall Ferguson THE PITY OF WAR, an effort to explain the causes and dynamics of the war is the latest work to treat the AEF's contribution somewhat dismissively. John J. Pershing was certainly not an original thinking strategist nor tactician and he was apparently unfamiliar with the management principle of span of control. Casualties were often heavier than should have been necessary and the US First Army got bogged down temporarily in its biggest operation, the Meuse-Argonne Offensive. But there were reasons for all this from a lack of experience by all the American soldiers starting with Black Jack Pershing to the insufficient number of trucks provided and the inadequate road network for the Argonne battle. Besides, the generals and doughboys of the AEF by the urgency of the moment had to learn by fighting; and the logistical problems of the Meuse-Argonne were all solved within a few weeks with the adversary driven from a position he had occupied and fortified for four years . It is astonishing to discover other historians or commentators who miss the overarching point of the American participation in the Great War. In minimizing the value of the AEF on the battlefield they fail to analyze what its absence would have meant. Without General Pershing's forces on the Western Front, Germany would have won the World War! By New Year's Day 1918, the British Army had been bled before Passchendaele, the French Army had suffered both defeat and mutiny from the Nivelle Offensive and Russia, then under Lenin, had withdrawn from the war. With its victory on the Eastern Front, the German Army had available over a million additional men to transfer to the West. The key to Allied victory was Morale. It was the intense and undiminished morale of the US military combined with a staunch domestic backing which convinced the German they could no longer continue. When their morale collapsed on all fronts they sued for peace. The AEF with its operations broke the German morale. Absent the arrival of the Americans, Ludendorff and Hindenburg did not have to make a desperate and exhausting roll of the dice as they did in resuming the offensive in March 1918. As Winston Churchill pointed out, with their reinforcements from the East they could have sat on their occupied sections of France and Flanders and dared the Entente to attack. Would Petain have ordered his enervated Poilus back on the offensive? Would Lloyd George have provided Douglas Haig the manpower to attempt a new variation on his 1917 campaign in the Ypres Salient? Without the presence of the AEF to provide the decisive margin it would have been most unlikely. The promise of a large AEF buoys French morale when their Army has been defeated and in mutiny. American naval vessels allow the convoy system to succeed, keeping Britain in the war and facilitating the transport of the full expeditionary force to France, while freeing British ships to turn their blockade of Germany into what Capt. Liddell Hart called a "true stranglehold". 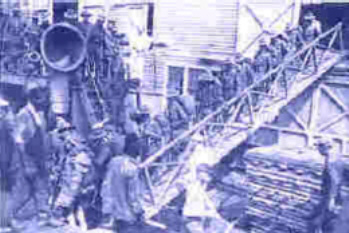 American soldiers arriving in accelerating numbers compel the German High Command to attempt to win the war in early 1918 before the American presence can be decisive. Initially, the doughboys are able to take over quiet sectors of the front, allowing British and French units to rest or redeploy to more active locales. The AEF defends Paris on the Marne River line at Chateau Thierry. Subsequently, US divisions totaling a quarter of a million men serve as the core attacking units in the Aisne-Marne counteroffensive of the Second Battle of the Marne. The continuing avalanche of fresh American troops devastate the morale of both Germany's frontline soldiers and their high command; their presence also encourages the governments of Great Britain and France to allow their armies to continue the offensive operations necessary to expel the opposition from occupied territory. At the St. Mihiel Salient and in the Argonne Forest, the US First Army mounts two major offensives on the same front within two weeks of one another; concurrently, the II Corps of the AEF collaborates with Australian troops in capturing the St. Quentin Canal in the Somme Sector. 55,000 Americans fighting under the 4th French Army capture Blanc Mont Ridge and force the abandonment of the Champagne by the German Army; King Albert of Belgium receives comparable American reinforcements for his assault in Flanders. The reorganized First Army, despite enormous criticism, has met all the objectives of the Meuse Argonne Offensive and is threatening the Meuse-Antwerp line, the latest defensive position of the enemy. The new US Second Army is deploying and initiating operations below Metz to the east. The AEF is now occupying 83 miles of the Western Front compared to 70 for the British Army and is planning to mount yet another major offensive on November 14th. But then the end came! During 1999 the Great War Society has sponsored an international seminar on the AEF and dedicated a large part of its internet resources to tell what we have concluded is a neglected part of the story of the First World War. Hoping you will visit the other articles and features of the Doughboy Center and gain some appreciation for the great national effort and sacrifice the United States made in striving for victory during the last nineteen months of what was then the greatest war in history. Sources and thanks: Sal Compagno wishes to express his sincere thanks to website editor Mike Hanlon for his contribution to this article. We welcome comments and will consider adding other opinions to this section. Please contact us through the email addresses below.